In this lesson, we will give a short summary of exponents: positive exponents, zero exponents, negative exponents, fractional exponents, adding exponents and multiplying exponents. 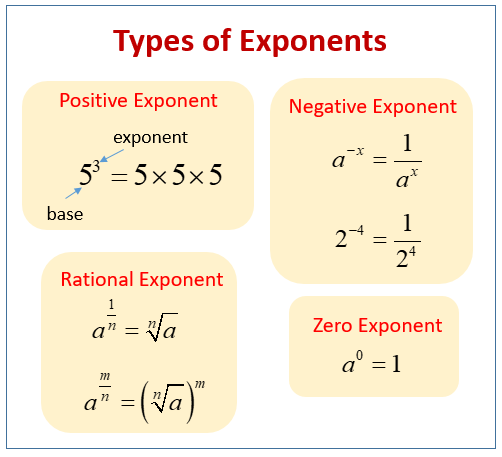 The following diagram shows the types of exponents: positive exponents, negative exponents, rational exponents, and zero exponents. Scroll down the page for more examples and solutions for the types of exponents. Exponents are a shorthand way to show how many times a number, called the base, is multiplied to itself. A number with an exponent is said to be "raised to the power" of that exponent. is the square root of 4.